We run a traditional programme of productions that ensures all students at each age group can get involved. 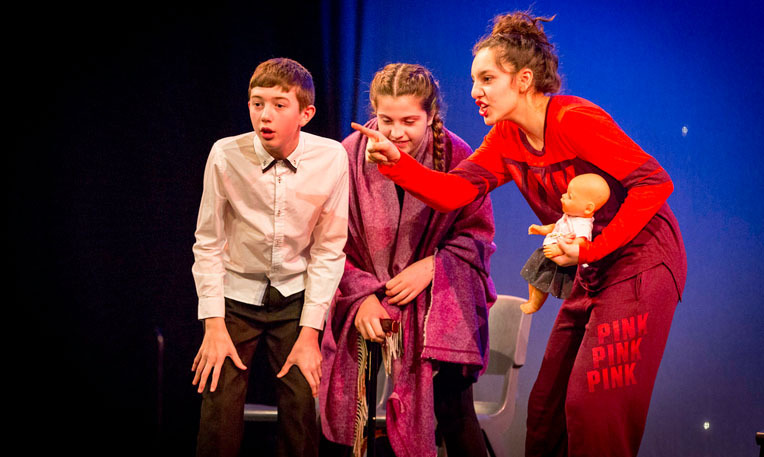 All our productions are very inclusive and students can choose to take roles both on stage and back stage, irrespective of whether they have selected Drama as an option. In the Autumn Term we produce a Senior Play, directed by drama staff and traditionally cast from the sixth form, although GCSE students have been known to take part. Spring Term has seen a variety of productions and we have produced either a Junior Play, Dance Show, Cabaret or a Musical in this term over the years. An end of year celebration of the talent in Year 7 completes the Summer Term and we have developed a Performing Arts Festival offering pupils the chance to compete in a range of categories for music and drama trophies. Tech Club offers technically minded pupils the opportunity to learn technical theatre and run the school productions. This is taught by our experienced Theatre Technician. Tech Club pupils also run the school radio station. All students at GCSE and A Level get the chance to go on various theatre trips to see many and varied productions for their exam courses. Students also get the chance to work with professionals and get involved in Q & A sessions pre and post show at theatres such as The West Yorkshire Playhouse and The Carriageworks. For school productions, actors and back stage crew put in up to 8 hours a week extra time from 4pm to 6pm rehearsing under the direction of the drama department and the Theatre Technician.